Balancing healthy eating while traveling is one thing that attendees don’t have to worry about while attending the annual Oldways Supermarket Dietitian Symposium. Rarely does one leave a professional conference and feel like their nutritional intake has actually improved, but the food served at this event is given as much attention as the rest of the program. The seventh annual Oldways Supermarket Dietitian Symposium, hosted at the Hotel Valley Ho in Scottsdale, AZ, served up Mediterranean-inspired meals that featured bountiful quantities of plant foods, heart-healthy fats, and a variety of proteins including seafood, poultry, pulses, and eggs. Gluten-free? Vegan? No problem! Just one week after a giant blizzard hit the east coast, 51 dietitians, health & wellness directors, category managers, and communications specialists from supermarkets from the U.S., Canada, United Kingdom, and Australia landed in 90-degree weather for a much-needed break from winter. 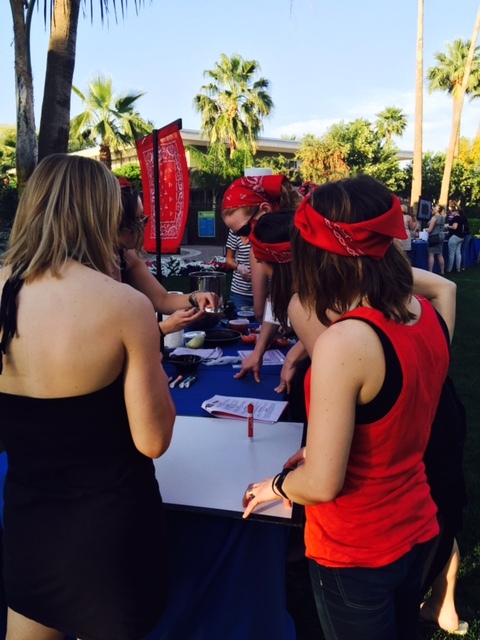 POM Wonderful, a top sponsor, treated everyone dining on the rooftop that provided views of Camelback Mountain, to wine and a champagne-POM bar where guests could customize their drinks. Despite the fact that many traveled most of the day on Sunday and were battling time zone changes, a hearty bunch took advantage of morning yoga to start oﬀ the ﬁrst day of education. Fortunately, everyone was well-fueled thanks to the breakfast bar from second top sponsor Siggi’s Dairy, which introduced everyone to the art of preparing their own “Nordic Bowl” with toppings including salmon, farro, diced cucumber, and dill-spiked skyr. For those less adventurous, fresh ﬁgs, mango, berries, walnuts, almonds, avocados, and a variety of whole grain options were available for a more traditional breakfast. This year’s event, themed “Empowering Advocates for Change,” highlighted breakout sessions led by dietitian leaders and aimed at helping attendees gain valuable skills to advocate for their roles within retail. Although data from the Food Marketing Institute (2015) reported that 95% of U.S. retailers employ a dietitian at the corporate, regional, or store level, in the past seven years of this event, we’ve witnessed a ~20% turnover rate of RDNs leaving their supermarket jobs and pursuing positions outside of retail altogether. This event is built on the belief that supermarkets play an important role in transforming public health and that dietitians are key players when it comes to advocating for customer health. A recent article written by Bruce Y. Lee published in Forbes, “Grocery Stores Taking More Active Roles in Health Promotion,” reported that, “Grocery stores, supermarkets and other large food retailers do not simply ‘store’ food. They, in fact, can play a major role in what you choose to eat and drink.” One of the sessions at this year’s event, led by Jennifer Egeland, MS, RDN, LD, Natural & Organics Category Manager from Value Merchandisers and Stephanie Schultz, MSM, RDN, CD, Senior Director of Communications at Skogen’s Festival Foods, empowered attendees to think beyond their credentials as health professionals. Kathleen Zelman, MPH, RDN, Director of Nutrition for WebMD, led an important session on ethics and responsible communications aimed at helping dietitians walk the balance as health professionals working in the retail sector. And as more dietitians and supermarkets evolve to reach consumers with social media, Sharon Palmer, RD, nutrition editor for Today’s Dietitian Magazine and Erin Long, MS, RDN, Retail Healthy Living Coordinator at Weis Markets, led an informative session on “Making Videos on a Shoestring.” The topic resonated well and complemented another session on social media trends presented by Kara Lydon, RD, LDN, RYT on behalf of the Mushroom Council and Carrie Taylor, RDN, LDN, Lead Dietitian Nutritionist for Big Y Foods. 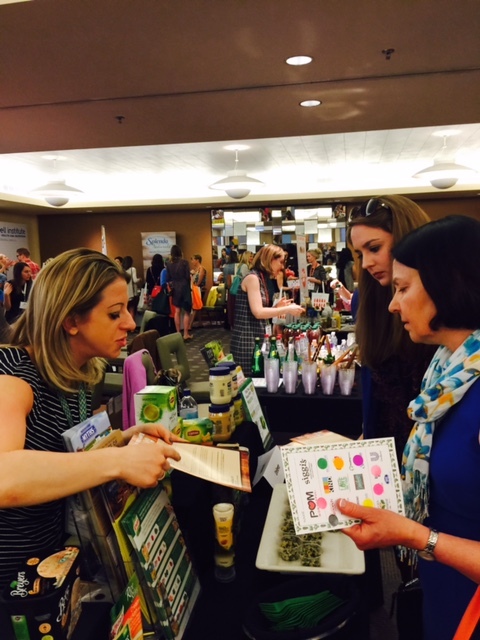 Some brand sponsors partnered with retail dietitians to demonstrate how to engage customers while also driving sales. Of course, there was plenty of fun, networking, and connecting with new and old friends. After earning most of their 11 continuing education credits during the Monday session, the dietitians did what they know best: cook! The Hot Mama’s team took the ﬁrst prize during the chili cook-oﬀ with their marketing prowess but faced tough competition from the other hungry competitors. Like we say every year, “It can’t get any better!” We look forward to the challenge to up the ante yet again in 2018.